Check out Lee Bermejo's variant cover to Skye Runner #3! 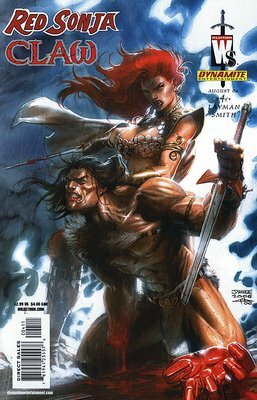 After leaving Wildstorm studios, Bermejo's gone on to do a lot of cover jobs lately, so it's cool to see him doing something for the 'Storm again. 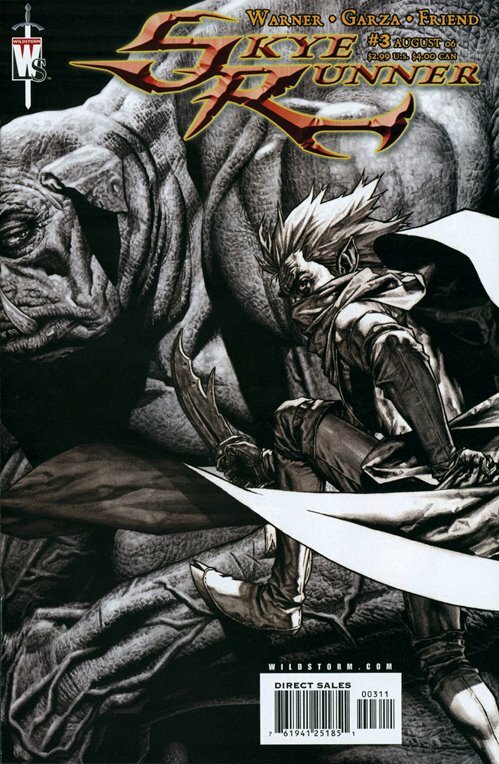 His Glyph and the giant monster behind him look like they're right out of a movie too! Inside, Skye meets her shining green knight in armor and the mystery of her niece and nephew deepens as she follows Omar the unicorn into more trouble. This issue hits stores next Wednesday and Lee's cover is a 50/50 split with Alé's, so be on the lookout for them both. Jim is also doing a variant for this issue, so check back next week for a look at that one too. 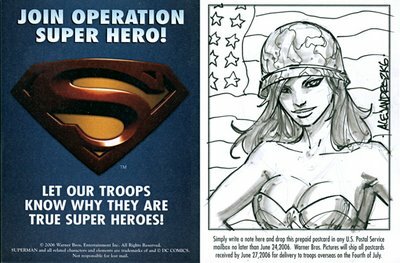 I think Rich has already said what the rest of us feel in the studio, so here are more postcards to help support our military men and women overseas. Stay safe, be strong and come home soon! one more Originally uploaded by Gelatomettista2. Here's another. Figured since Warner Bros is probably flipping the bill I should give equal time. A Unique Privilege Originally uploaded by Gelatomettista2. 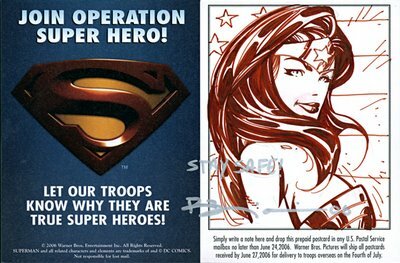 Warner Brothers has given their employees a special way to say thanks to all the men and women of the armed forces on this upcoming 4th of July. 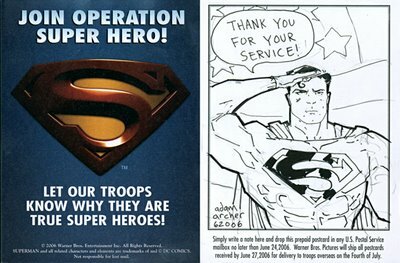 We've been given postcards which we can write a little note on and they are all going to the soldiers overseas in Iraq. I had the coincidence of meeting a guy yesterday who's going over to Iraq in less than a month. It really makes any problems I have here at home seem very insignificant when people like him are brave enough to go and support our country. I asked the guy I met..."do you think they will like a drawing on the card?" and he said; "Yes and they'll probably keep that thing forever." That just blew me away and I really bared down and just decided to do as many as I possibly could. It's just mind boggling how brave all these soldiers are and what they are sacrificing for us here in the United States. It's really important we don't forget them and that we support them in any small way we can. So the Superman Returns premiere is tonight and a bunch of DC brass are here to represent. I've caught just some of the reviews and they have been uniformly very positive so I am really looking to this flick. Even at 2 1/2 hours, the movie is by director Bryan Singer (X-Men, the Usual Suspects) and I expect it to really recapture the essence of the original Donner Superman flicks. 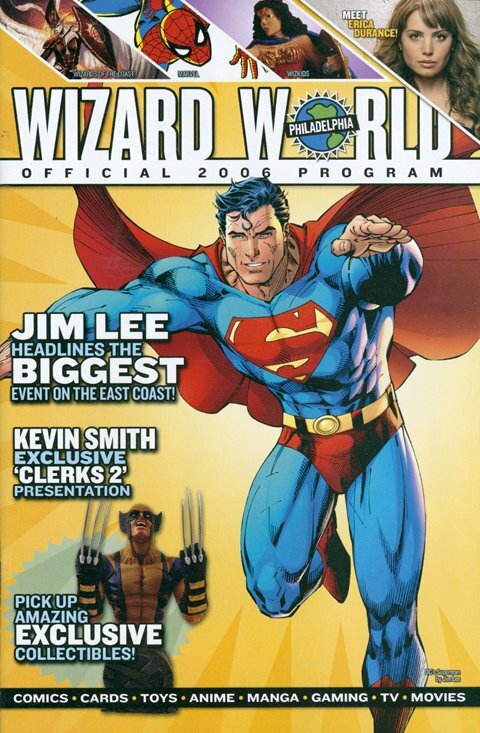 I'm real curious to see how today's CGI shows off Superman's powers. Superman Returns with Jim Lee! 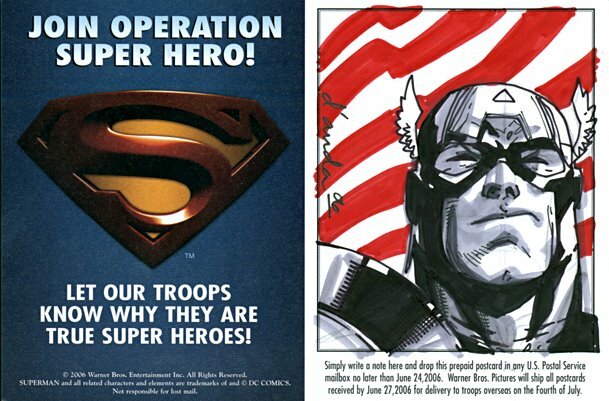 Where can you win prizes by inking one of Jim Lee's Superman pages, bid on rare comics, meet your favorite creators and then go see a movie with them too? Missoula, Montana, that's where! 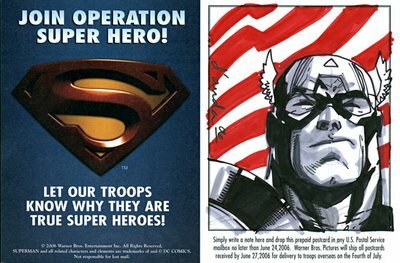 Join Jim, Carlos D'Anda, Alé Garza and Sandra Hope at Muse Comics on June 30th and you can do all of the above, including a screening of Superman Returns too! This movie's already earning some rave reviews and it doesn't get any better than watching it with some of comic's top talents! Okay, watching it with Brandon Routh or Kate Bosworth would be better, but you get the idea. Anyway, head on over to Muse Comics for more info and don't forget to leave your kryptonite at home! 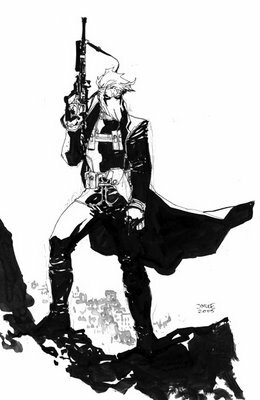 Grifter is dead. Long live Grifter! 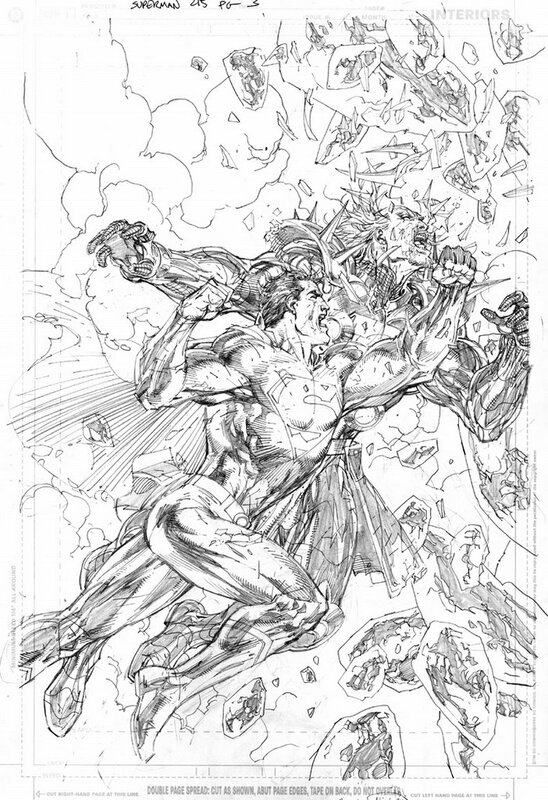 Yesterday, the cataclysmic Captain Atom: Armageddon #9 hit stores and it asked the question, "Is this really the end?" Well, yes and no. So which title are you most looking forward to? Twenty-four hour room service was music to my ears when I checked into my hotel late Thursday night. And flying across country can lead to a very empty stomach too. The hotel's menu was pretty limited past eleven, but it still had the one thing I was looking forward to eating: A Philly cheesesteak. And it was delicious too. It was a nice way to start my Wizard World Philadelphia trip and, after a little jet lag, I was off to sleep. The weather Friday morning started out with a cold, gray drizzle of rain, but I was close enough to the con that it didn't matter so much. 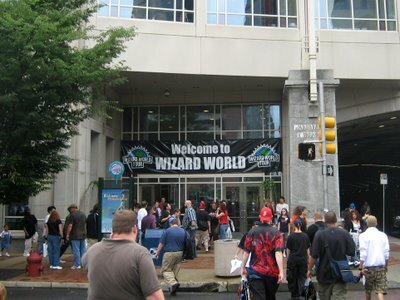 The photo above was taken Saturday afternoon when the weather had cleared and fans were still on their way to comic nirvana. For me, one of the fun things about going to these conventions, is meeting friends both old and new. And for this year's show, I was staying with a friend whom I hadn't seen in a year or so and had just flown in that morning. After dropping his luggage off in our room, we quickly made our way over to the con and went directly to Artist's Alley. Apart from looking through back issues, this is where I spend most of my time at conventions. 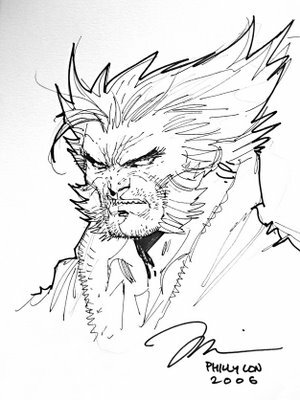 It's always a surprise to see who's sketching, how much they're charging and who's got the longest line, which sometimes doesn't depend on how popular they are on the comic racks as it does how well and how fast they can sketch at the show. 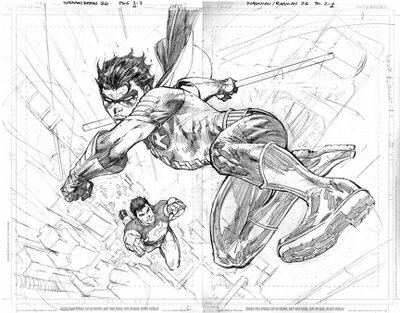 Word can spread pretty quickly as to which artist is doing the best sketches. And it's also much easier to talk to your favorite artists as opposed to the more popular exhibitor booths where the signings are much busier. 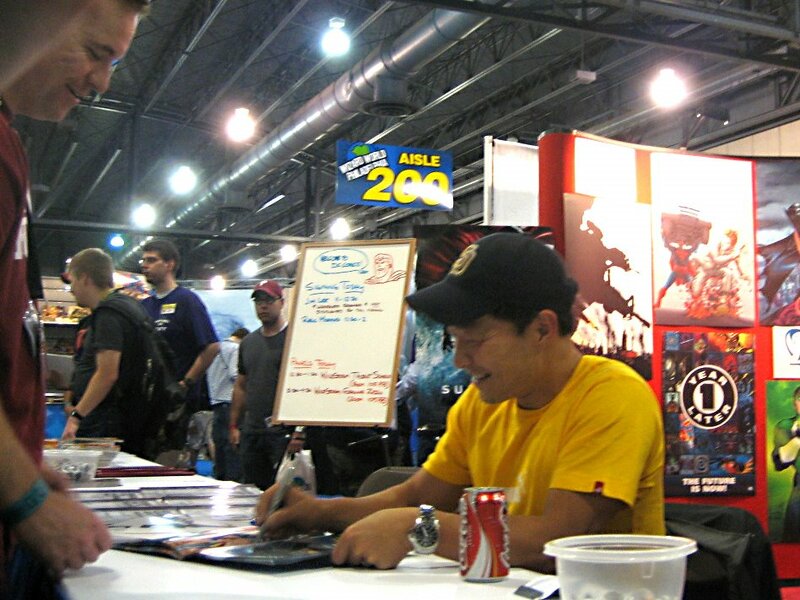 One of those busy signings belonged to Jim Lee who was Guest of Honor this year and had a growing line to go along with it. Most fans were pulling out their Batman comics to get signed along with the program itself, which had his Superman on the cover. Jim had also just finished doing another convention in Mantova, Italy, so it must've felt like one long line of fans stretching around the world to meet him. He also had a "One on one" panel going on later in the day, plus a signing at the DC booth, so his day was definitely full. Everyone's got eat sometime though, so we squeezed into a cab and found the nearest cheesesteak place where I learned the best way to eat a Philly cheesesteak is with some hot, melted Cheez Whiz. Two days in Philly and I've already had two of 'em. So far, so good. 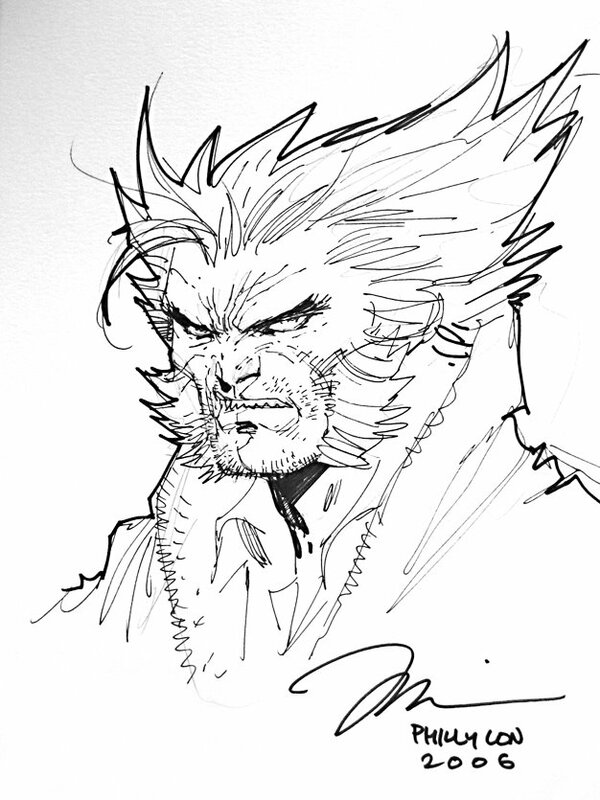 I noticed he usually sketches Logan without his mask too and he said it's just more interesting to draw his face. Personally, I think the mask looks much cooler, but of course, Jim's no slouch at drawing him either way. Jim also brought all four of his Red Sonja/Claw covers straight from Italy for his original art dealer, Albert Moy, who was also at the show. Gabrielle Dell'Otto had painted right on top of Jim's pencils, so this was the first time I'd seen the originals in person and they were beautiful. I was surprised how smooth the art was too, since it looks like Gabrielle's paintings have so much texture to them that they really pop off the originals. 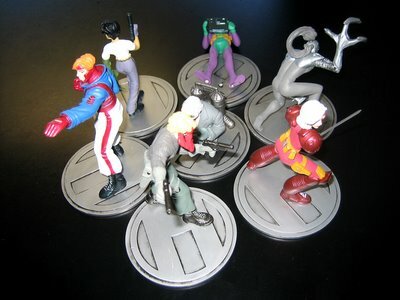 I don't think Albert's posted them on his site yet, but be sure to drop him an e-mail, if he hasn't sold them already. Back in the dealer's area of the show, I saw one guy selling a few 9.8 CGC All Star Batman & Robin #1s for $25 each. I'm not really into the whole CGC thing, but it seemed almost too good to pass up. Unfortunately, by the time I went back on Saturday to buy one for a friend, they were all long gone. I did see another one going for $80 bucks at different dealer's table, but that one sat there throughout the whole con. On Saturday, it got a lot more crowded, so the day was mostly a blur. More walking around, more signings and more digging through long boxes or as my friend calls it, "dumpster diving." My big find of the day was a Gen13 hardcover, collecting the original mini-series from back in the day, for half off cover price. I've never had one before and it came complete with a cool wraparound cover by J. Scott Campbell. He also drew another Batman that went for about $700, a Hal Jordan Green Lantern and a funny piece with Amanda Conner that has to be seen to be believed. 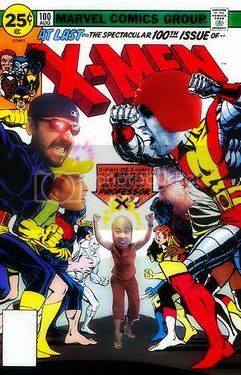 All I can say is that it involved Batgirl, the Atom, Wolverine and his "Snikt" and will just leave it at that. I'll see if I can dig up a scan of it for later. Anyway, the panel helped raise over $4,000 for the CBLDF and put some nice pieces into the hands of some happy bidders. After the con, I was lucky enough to watch an International Fight League match over in Atlantic City thanks to Wizard's very own Gareb Shamus. I've barely been getting into the whole mixed martial arts thing lately, so it was cool to see some matches in person. But let me say, I've never heard the words, "Brazilian Jiu Jitsu" so many times in my life. The next day, my friend explained the whole thing to me, but I could see for myself these guys took their fighting seriously with moves like the "rear naked choke hold" and the good ol' fashion fist to the face. Now, that's gotta hurt. Things were pretty much winding down on Sunday, but Jim was still going strong with a signing at the DC booth, the "Wildstorm Talent Search" panel and another one on "Wildstorm: Ground Zero." There were a lot of hopefuls in the room for the talent search, but ultimately it came down to three talented pencilers with one of them winning by a big show of hands from the audience. Right after the panel, I also met one of my friends who I've only seen once in the last eight years. He'd read about my new job online and contacted me through this very blog, so it was great to get back in touch with him again over a couple hot dogs at the show. By now, I'd already filled my luggage to the top with comics to take back home, but I saw one more thing I just had to have. I must've walked by it a hundred times throughout the convention too, but never noticed until the closing minutes of the con. It was a box set of the WildC.A.T.s PVC figures that came out back years ago. Unfortunately, Maul didn't make the trip home intact, but I still couldn't pass up the whole set for $5. I also had plenty of time to catch my plane back at the airport, so I had, what else? Another Philly cheesesteak for the road. That should last me until next year's show. more new art Originally uploaded by Gelatomettista2. Here's some more new art from me. I am in the middle of scanning and backing up a lot of my new work and this one I had mentioned to Eric Canete yesterday (he had asked me about the African piece I had done a few weeks back). This is probably one of the most complex pieces I have ever worked on. The mental juggling this took to complete was really tough on me and it stretched me about every way it possibly could have. I was ready to give up several times but saw it through to the end. I still haven't spent enough time with it to really be subjective in terms of looking at it as anything more than a lot of work...I am glad I did it though. Starting and finishing things is an important part of the learning process. When Eddy first asked me to include notes for the coloring of this spread, I was ready to give him 52 ;) reasons why I couldn't. Then I remembered how much working on this piece had meant to me because of who and what it was for. 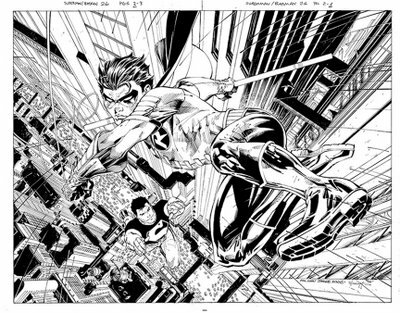 I had worked with Jeph (and Jim, Scott and the rest of the team) on Batman Hush and loved every page of that run. When I heard about the book and what was being done with it, I e-mailed Eddie Berganza (editor) letting him know to use me as much as possible on it. For this spread, I went for a dominantly cool palette throughout the city to pop the characters who have red, yellow and flesh as main colors. Since there is a ton of black and detail involved, I knew that value would have to play a big role in the final picture. The flat JPEG shows my starting point. As I started rendering, the city took on more of a monochromatic feel because I decided to use the same color to highlight everything with. I kept the light hitting the characters natural or white so the warm tones would jump out even more. The final JPEG shows all the glows on the piece. I added quite a few to play with the values, never messing with the blacks on the figures--> Values! My first foray into the blogosphere! All of a sudden I feel like a 21st century renaissance man. Eddy asked me to stop by and highlight some of my thoughts on inking this particular piece, which I am happy to do, and in no particular order. 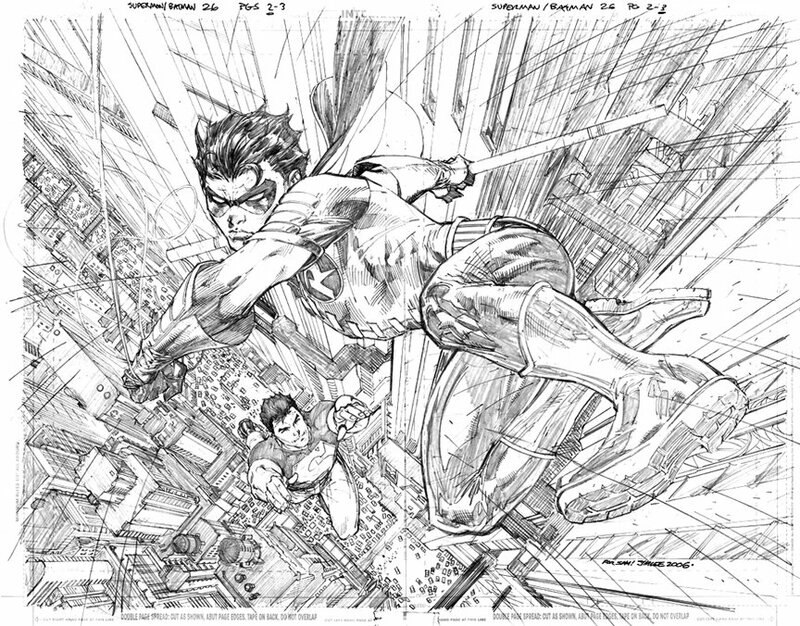 This was a pretty straight forward ink job vis a vis working on top of Jim's pencils. The figure work was pencilled very tight, and you'll see very little deviation going from pencils to inks. 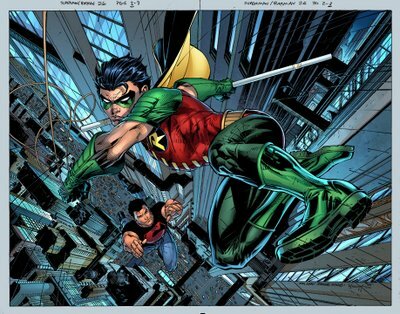 If anything, I blew it in regards to Robin's right eye (on the viewer's left) in that the shape and size changes, getting a bit larger. I try and take great pains in staying as true to Jim's facial structure as possible, or anyone else I ink for that matter. The change here is subtle, but there is almost no such thing as TOO subtle when it comes to faces. On the other hand, I made some minor changes to Robin's hair, since I feel I only need to keep the hairs flow and relative highlight patterns, but will generally simplify the details a bit. Other than line weights and contours, I didn't really change or feel the need to change much else. 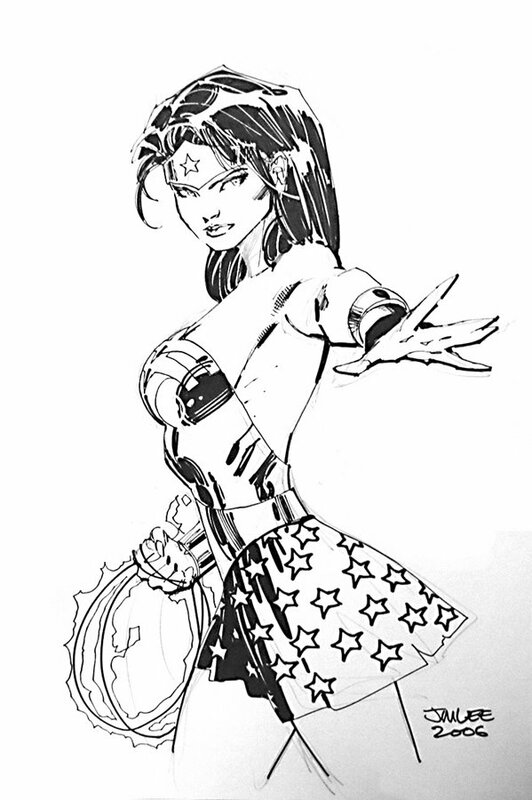 Superimpose the inks and the pencils on top of each other and jump back and forth. You'll be able to see a where I took a few artistic liberties. The background was similarly complete, and the only alterations you'll see are some additions of detail structures in the rooftops, some added ledges and edges. 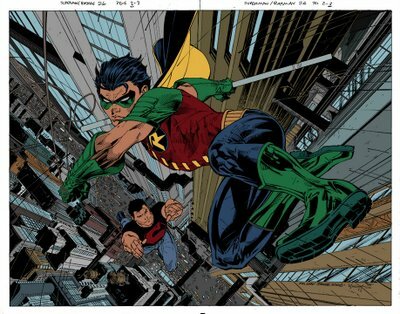 I also splattered some detail in a few of the buildings blacks, as well as just off Robin's left hip (to separate him from the background a bit). Little bits of surface detail (dits and dashes) on the buildings are added, and added highlights to the speedlines complete most of my contributions. 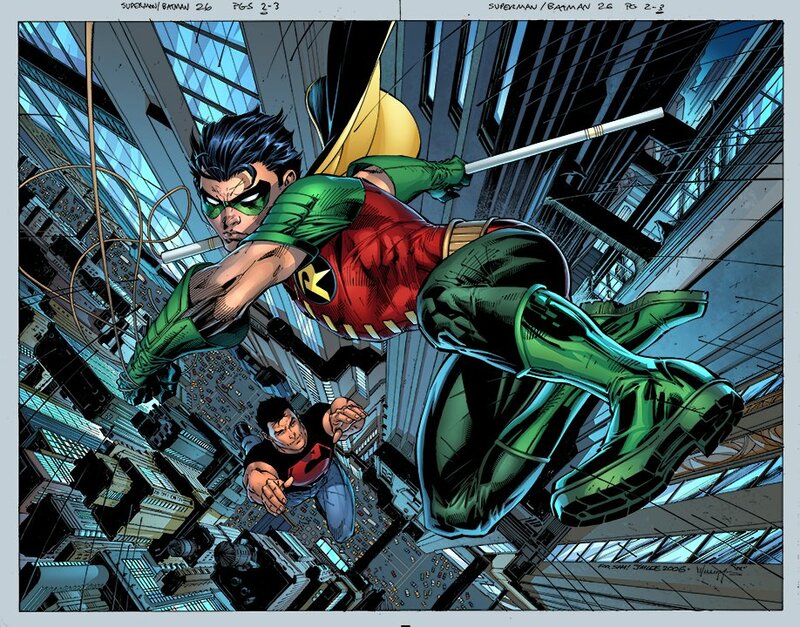 Thanks to everyone who guessed yesterday, and yes, the major changes I was referring to were Robin's chin and arm. The changes in today's post should be pretty obvious with the background being finished, but can you spot the subtle changes to Robin's stomach and chin too? They're really subtle, but show just how much attention to detail Jim continues to put into the piece until the very end. And check out those speedlines! If you haven't already, be sure to pick up SUPERMAN/BATMAN #26 too, to see the final inked, colored and lettered piece and also to show your support for Sam Loeb. 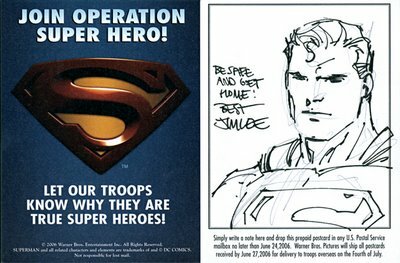 And if you're also in the Philadelphia area this weekend, stop by the convention center to have Jim, Michael Turner and Geoff Johns sign your copy too! The finished and inked original art for this piece will also be auctioned off, along with the art from the rest of the issue, at the Wizard World Chicago show on August 4th-6th where Jeph Loeb will be on hand as the Guest of Honor! 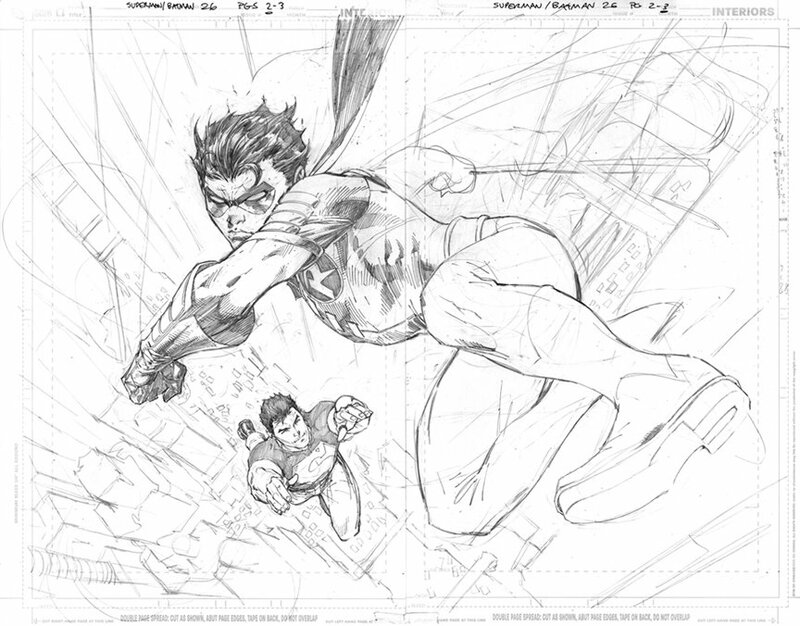 Can you spot all the major changes from the original rough? Also, check back tomorrow to see the background come into view and don't forget to pick up SUPERMAN/BATMAN #26 in stores today.